Located adjacent to the Sting-Ray’s Restaurant, carries fine pottery from the Southwestern United States, Mexico, and Asia. Check out our pottery designs in our 7,000 square foot facility where we also carry home furnishing and other fine gifts. From time to time, we will have items online but our ever increasing inventory is always available in our store. 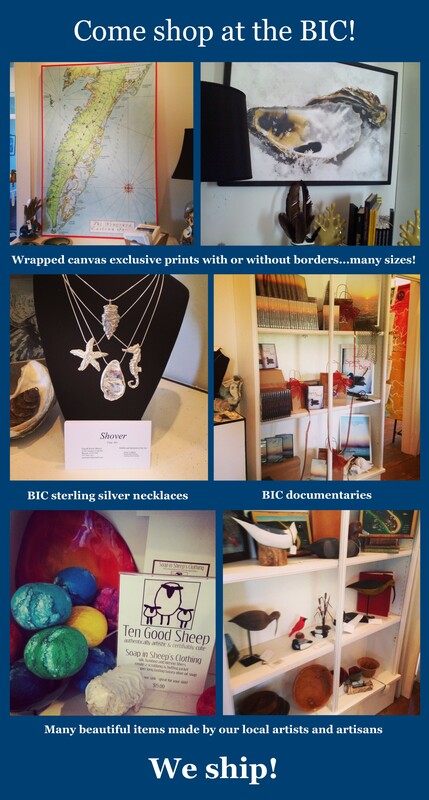 Visit Moonrise Jewelry in Cape Charles and see why Meryl Streep and SPANX® Founder Sara Blakely love this locals' favorite! You'll find a stunning variety of original styles by our local Designer Meredith Restein, including our signature Real Orchid Blossom, "Reel" Fish Leather, and Coastal-Inspired Jewelry. Each piece of Moonrise Jewelry is handcrafted right here, so step into our Studio and see where the magic happens! You can watch our artists at work, and have your jewelry customized to suit your needs, while you wait. Whether you're shopping for unique gifts, the perfect accessory for a new look, or a custom design for that special occasion, Moonrise Jewelry is THE destination for jewelry-lovers of all ages! Sting-Ray's restaurant, also known as the "The Cape Center," has been a tradition for more than 50 years on the Eastern Shore. Wine Tastings Every Friday and Saturday! Drizzles is a tasting shop where you can come and taste before you buy. We have Olive Oil, Balsamic Vinegars, Salts, Pepper, and single source Coffee from around the world. Drizzles is a beautiful, well decorated and quiet shop where you can look for unusual things to taste, take home or give as gifts. Drizzles is a place where you will want to spend some time and try things that are delightfully good to taste and good for you. Drizzles is a local shop that is hidden within the countryside between the Chesapeake Bay & the Atlantic Ocean in a small Bay Front community named Cape Charles Virginia. Cape Charles is a place where you will find a number of Bed & Breakfasts or beautiful townhomes to rent but no motels. Where you can drive your Golf Cart in the city, wander the streets lined with old houses, swim on the free beaches, play Golf on two Championship Courses, dock your boat at one of the two Marinas, take long bike rides in the country side, or just kick back and enjoy meeting the friendly locals. This is a place that you have been looking for… An undiscovered and really beautiful small town with all the things you would find in a large modern resort, but without the noise and crowds. We are now OPEN DAILY! Please contact the store for information or to just say hi. Previously In My Backyard in Cape Charles, this new Garden Market has a great variety of grasses, shrubs, trees, perennials and annuals along with local art and one-of-a-kind objects. Clelia Sheppard still feels nostalgia for her native Italy—the art, the landscape, the savoring of life’s pleasures. But after 25 years of living on Virginia’s Eastern Shore, she has developed another true love of land and culture. Artist, non-profit maven, and now entrepreneur, Sheppard is deepening her roots in Cape Charles with Lemon Tree Gallery and Studio, an interactive space that will build on the town’s new tradition of global and local arts. Sheppard is not alone. Since 2011 her daughter Renata has gathered international artists to create films and interactive art pieces in the historic small town by the Chesapeake Bay. A choreographer and artist, Renata is now spearheading her creative placemaking initiatives under a new organization: GEAR— Global Exchange Arts Roundtable. Lemon Tree, which occupies the space formerly known as the Stage Door Gallery, is Sheppard’s new venture after directing Arts Enter Cape Charles for nearly two decades. “Now I can concentrate on evolving as an artist while being an active participant in the lives of other creative people, which inspires me,” says Clelia, who will manage the gallery with former co-director of Arts Enter, Mary Ann Roehm. Renowned water colorist Thelma Peterson and emerging painter Bethany Simpson join Clelia as Lemon Tree’s permanent artists-in-residence. Rebecca Daryl Smith, a fiber artist from Brooklyn, is the featured visiting artist for the inaugural exhibition, which runs from April 9-June 19. The Lemon Tree Collective will include works by both local and regional artists from an eclectic range of genres, including plein air, realism, abstract, and modern art. Friday Nights at Lemon Tree will include flatfooting with live Appalachian music and occasional Salottos, inspired by the Italian version of art salons. “The goal is to have a conversation built on respect and curiosity,” says Renata, who is working to connect Cape Charles to Hampton Roads, and Hampton Roads to metro areas like New York. DC, Richmond, and beyond. Love Letters, in picturesque Cape Charles, is a specialty retail shop with a personalization bar. We are also happy to be part of the Scout bags team. Come discover our take on fun and games! You'll laugh out loud (& maybe blush a little). Voiajer was born in June 2017 with one mission: to share beautiful world changing gifts with our friends. Our passions for supporting families living in abject poverty while also being sustainable to the environment combine harmoniously through our products. We create an experience where you can explore products and touch the lives of many while also enjoying the charming town of Cape Charles. Stop by to see for yourself! Stay in a beautiful, historic hotel/inn in the old Victorian town of Cape Charles, Virginia, right on the Chesapeake Bay! Lovely rooms, gift shop, tea room, facing harbor and Bay. Each room has a large balcony with comfortable seating. The retro chic hotel is designed to offer a relaxing, comfortable and unique beach experience. Cape Charles Candy Company was established by Phillip and Jordan Dail in 2018. Tonic waters, mixers, bitters, bourbon balls, cocktail books, notecards, honey, paper placemats, candles and other goods. Chef Jason Van Marter's delectable creations Thursdays - Sundays. Experience the whimsical world of Sheep Lady Design at The Sheep Factory. Browse through handmade gifts, books, dog accessories, purses and jewelry to find that perfect gift. Because our hams need no refrigeration prior to cooking, many of our customers hang their hams in the kitchen where their wonderful aroma fills the senses. Virginia Country Cured Hams are neither precooked nor sliced and require a little extra effort to prepare them, but we know you’ll agree they are well worth the time. To provide you with the very best in flavor, our Virginia Country Cured Hams are cured with salt and sodium nitrate. Pepper coated and cold smoked with hickory and red oak. Gift Shop is next to the CBBT Restroom in the ES Tourism Welcome Center building beside the North Plaza of the bridge.